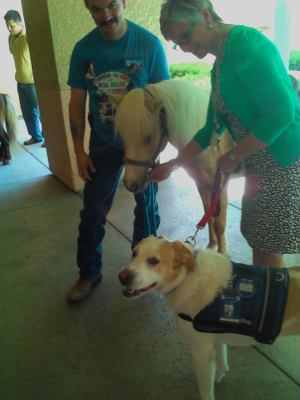 Dillon our pony and Elliott, Jill Bemis’ therapy dog and friend. Our surprise visit on Thursday June 27, 2012 brought a lot of smiles on the inside and out. Tucson Medical Center Pediatrics, Square and Compass Children’s Clinic and Peppis House (hospice) always welcomes us with open arms no matter what day or time it is. Dillon gave his usual saddle rides while Sir Snicker was led by many children who had never walked a horse before. 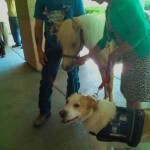 It felt like a real dog and pony show at the Clinic. Our two boys shared the spot light and attention with a couple of therapy dogs, Elliott and Molly, and believe me there were plenty of smiles to go around. Peppis House started with a smorgasbord of apples, watermelon, grapes, a special staff and three children. The children were new to feeding and petting horses. Although they were willing to learn and kept feeding after the first couple of treats their little faces showed no emotion. At first I wasn’t sure if they were enjoying themselves but after observing them for a few more moments I believed their actions spoke for them selves. The smiles had to be on the inside—for sure!